"There's always time for the important things." As a sequel of sorts to his 1957 opus The Curse of Frankenstein, director Terence Fisher found himself continuing the often-told story of Dr. Frankenstein for Hammer Films, only this time without the services of Christopher Lee as the monster. With the returning Peter Cushing—easily English horror's most formidable screen presence—as the good doctor, Fisher's end result was one of the most sympathetic and bittersweet entries in the Frankenstein mythos. The Revenge of Frankenstein dared prove that Fisher could create a compelling, almost mainstream, motion picture within the tried and true Hammer horror framework, and this DVD release from Columbia TriStar, though lacking in extras (a crime unto itself), is a fine testament to what is probably one of the most underrated Frankenstein films of all time. As the film opens, Dr. Frankenstein (Cushing) is being led to the guillotine, as restitution for his crimes in The Curse of Frankenstein. The visual elements of this sequence are pure, unadulterated Hammer, complete with masked executioner, grave robbers and layers of swirling ground fog, and it stands as one of those practically near-perfect gothic horror film moments. Frankenstein makes a daring escape, aided by his faithful, deformed assistant Karl (Oscar Quitak), and Fisher then jumps the story forward three years, to 1863, to the village of Carlsbruck, where the doctor has set up shop as the mysterious "Dr. Stein," much to the chagrin of the local medical council. True to form, Frankenstein's secret plans still involve creating life from scavenged human parts, which he fortunately has ample access to as part of his work with the poor and destitute of Carlsbruck. On the surface, it is sort of like his own personal limb and organ farm, and the film wisely never makes it entirely clear if Frankenstein's frequently ordered amputations are necessary, or simply raw butchery as a source for experiment parts. Cushing, as usual, exudes a magnetic charisma that makes him extremely likeable, and even his cobbled-together "monster" (played by Michael Gywnn) looks like an average man, and not a hideous, scar-faced creature (as Christopher Lee was in The Curse of Frankenstein). Even the doctor's plans are more noble this time around, as he only plans to create a new body for his deformed assistant Karl, who for some reason or another is billed as a dwarf, though he is easily well over five feet tall. Quitak's shuffling, gentle Karl, another of those ideally gothic Hammer touches, is only in the film for a short time before he becomes the newly created Karl, and spends the remainder of the film portrayed nicely by Michael Gywnn. It's the underlying sadness of Karl struggling with his new body, and of course the inevitable problems that do arise (do not forget that this is a horror film). Karl is not a conventional movie monster by any stretch, and there is a genuine degree of real emotion and pity displayed by Gywnn, and that is one of the key factors that make Fisher's film so unusually effective. Jimmy Sangster's script (he also wrote The Curse of Frankenstein and another Hammer classic, The Horror of Dracula) provides a convenient role for Francis Matthews as Dr. Hans Kleve, a dashing young doctor who learns the real identity of Dr. Stein, and becomes a willing partner in the experiment to give poor Karl a new body. The character of Kleve seems at best to exist only to allow Frankenstein to verbalize his actions, making him often not much more than an expository sounding board. The Revenge of Frankenstein has many of the components of traditional Hammer horror (secret labs full of bubbling beakers, foggy streets and of course another stellar turn from Cushing), but it also has a surprisingly gentle monster whose story is as much sad as it is horrifying. 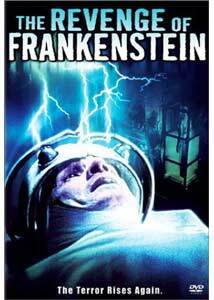 This one, over the years, has been sadly overshadowed by The Curse of Frankenstein, and though it lacks the pairing of icons Cushing and Lee, it is still a well made genre film that likely may have slipped under the radar of many. Image Transfer Review: Terence Fisher's strangely touching horror classic is issued here in an unexpectedly clean 1.66:1 anamorphic widescreen transfer. Despite The Revenge of Frankenstein's ever advancing age (now pushing 45-years-old), colors in this remastered release fare pretty well, though there are more than a few instances of color bleed. The scenes inside Frankenstein's illicit lab look marvelous, and all of Fisher's attention to detail comes through. More importantly, the source print is devoid of any significant blemishes, and that alone is worthy of high marks. I caught a film fest screening of Fisher's Horror of Dracula recently, and that particular film looked every bit its age. Not so with this disc; for its age, this one looks amazing. Audio Transfer Review: The Revenge of Frankenstein comes to us from Columbia TriStar with a very satisfactory English language Dolby 2.0 mono track. For an older film with such a nice image transfer, age is a hard element to hide in the audio department. The track suffers from that inherent thinness that most mono tracks from the late 1950s exhibit, but I wasn't expecting anything more, so my disappointment was limited. Though any low semblance of a low end is pretty much absent, the terrific Leonard Salzedo score and the dialogue is represented cleanly with a minimum of hiss. Extras Review: As important historically as the classic Hammer Films are, it certainly would have been nice if Columbia TriStar had treated these re-releases with a little more attention to the extras. Outside of a brief photo gallery of ten stills from the film and three trailers (including a nice one for the feature, at that), there is nothing else offered up. At the very least, some kind of text screen or liner insert to connect The Revenge of Frankenstein with it's predecessor The Curse of Frankenstein, and their place as pivotal English horror films. As far as extras go, thanks for nothing. The packaging only lists subtitles in English and French, but Japanese subs are also included. The disc is divided into 28 chapters. Hammer. Cushing. Those two words alone can say more than I ever could, and if they make your heart rate quicken just a bit, you know what I'm talking about. The Revenge of Frankenstein, from the vaults of Hammer Films, radically downplays the horror aspect in favor of a moving story anchored by another perfunctory performance from Cushing.